If you’re interested in music production and audio engineering check out this free 6-week online course, a project organized by the folks at NYU and MIT that will take you through the basics of working in a DAW, editing, remixing and mixing. It all begins November 1st. [NYC] Thurs. October 17th: Ableton Advanced Users Meetup — RSVP & Come Network! The next installment of our Ableton Advanced Users Meetup is taking place on Thursday October 17th, the same day AES kicks off in NYC. This is also the very last meetup for 2013 so don’t miss this last chance to catch up on all the audio buzz. Featuring guest hosts and resident presenters Hank Shocklee, Ben Casey from Tekserve and Brian Jackson from Devotion Learn alongside some dynamic and fun presentations from very special guests. Get in on the action and RSVP now! We’ll be live streaming it here 7:00-9:30 EST / 4:00-6:30pm PST / 1:00-3:30 CEST – tune in & join the chat! Stream The Ableton Advanced Users Meetup Live from Tekserve RIGHT HERE! 7:00-9:30 EST / 4:00-6:30pm PST / 22:00-00:30 CEST – tune in & join the chat! Follow the Ableton Advanced Users Meetup on Facebook or TechCampNYC on Twitter for group updates! FL Studio 11 is now available and the DAW formerly known as Fruity Loops has interestingly enough added a performance mode so now you can trigger clips live with support for a number of controllers. RSVP NOW for the next Ableton Advanced Users Meetup taking place Thursday, May 9th at NYC’s Apple specialist super store, Tekserve. Hosted by TechCampNYC with hosts Hank Shocklee and Ben Casey, regrouped and fresh off our massive, super packed Official Live 9 & Push Preview event last month, this next meetup is NOT TO BE MISSED. Our May 9th gathering will feature a wicked list of Ableton Live ninjas and performers. Watch the Ableton Advanced Users Meetup Official Live 9 & Push Preview event, New York City’s first look at the new releases which took place on Tuesday, March 5, 2013. It was a packed house so if you missed it or want to see it again, you can view it here in its entirety. 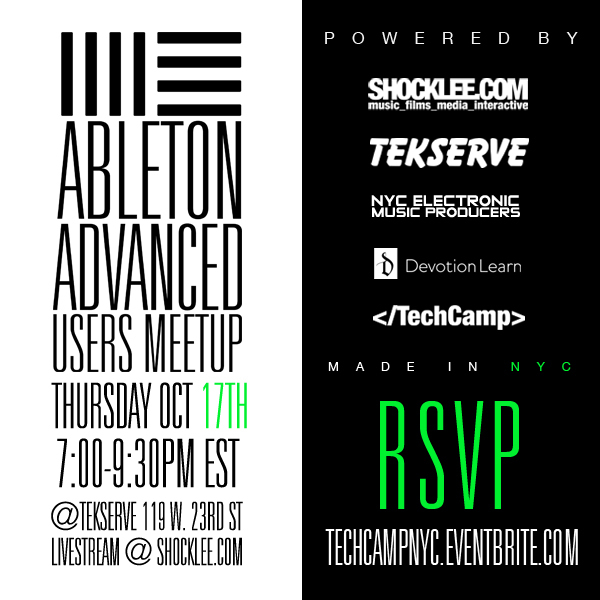 The Ableton Advanced Users Meetup Official NYC Live 9 & Push Preview Live from Tekserve is RIGHT HERE! We’re live 8:00-10:00 EST / 5:00-7:00pm PST / 01:00-3:00 UTC – tune in & join the chat! D.V.S* Added To Tomorrow’s Ableton Advanced Users Meetup Official NYC Live 9 & Push Preview Event – Live Stream It Here! Don’t miss tomorrow’s Ableton Advanced Users Meetup Official NYC Live 9 & Push Preview Event! We’re happy to announce that D.V.S* AKA Derek VanScoten – guitarist, producer and performer out of Brooklyn, NYC will be joining the line up and showing some of his live performance skills with Push! Remember if you’re not in NYC we’ll be streaming live right here!